The RFspace CloudSDR is a high performance, direct sampling software radio with an Ethernet interface. It offers outstanding low distortion, low noise and low spurious characteristics. 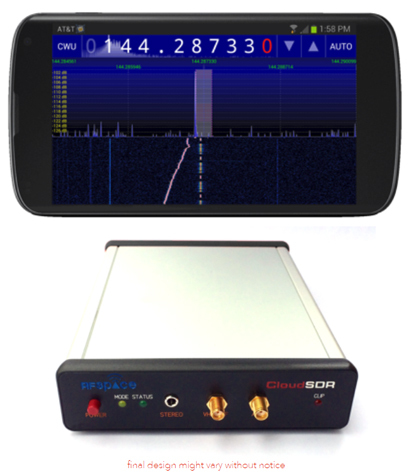 The CloudSDR radio was developed for both direct streaming of I/Q data to the PC, as well as, remote radio monitoring anywhere in the world. It performs spectrum analysis, demodulation, and streaming to a computer. The CloudSDR features two RF inputs. The low frequency port operates from 9kHz to 56 MHz and it is direct sampled at 122.88 MHz by a high performance ADC. The high frequency port uses a wide-band silicon tuner downconverter to cover the 56 MHz to 1.2+ GHz ranges. Both ports have built-in variable attenuation, preselection and surge protection. The CloudSDR is designed to be connected directly to antennas without the need of external amplifiers or extra filtering. The CloudSDR handles all of the streaming via Ethernet. It offers an I/Q streaming mode where the radios sends 24 bit I/Q pairs to the PC for processing. This I/Q mode offers one of the cleanest and highest dynamic range baseband signals that we have seen in any commercial receiver. The I/Q balance, DC spur, IMD and phase noise performance is superb. This mode of operation has a very high Ethernet bandwidth utilization which limits the use to direct to PC connections. In addition to the I/Q streaming mode, the CloudSDR has a low bandwidth, remote mode for Internet operation. In this mode, the radio will capture spectrum data as well as demodulate the signals of interest. The radio has built in demodulators for AM, SAM, LSB, USB, WFN, FM, CW, ASK, and OOK. The radio will compress the demodulated waveform using the high performance and phase continuous G726 and G711 codecs. The raw 64 kbit/s stream can also be selected if that is preferred. We will post additional photos, more technical information, availability and pricing as soon as it is released. This model is not expected until 4th quarter 2018. This device has not been approved by the F.C.C. This device may not be offered for sale or lease or be sold or leased until approval of the F.C.C. has been obtained. The information shown is preliminary and may be subject to change without notice or obligation.